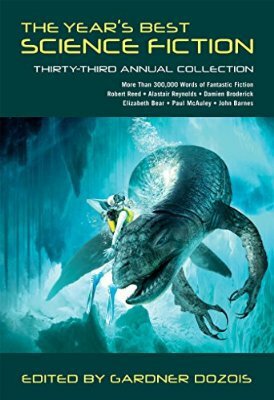 I think it's been out for a couple of weeks, but this arrived in the post this morning -- my contributor's copy of the 33rd edition of the indefatigable Gardner Dozois's Year's Best Science Fiction anthology. My story, 'Planet of Fear', set on a Venus that never was, is one of thirty-six selected from a huge range of sources. Check it out. First post here for a while. I'm working on the edit of Austral, pruning, hewing, chopping, trying to make the commas behave, the sentences make the sense they're supposed to make, the paragraphs paragraph where they should, and to check that hats maintain their continuity. The cover, by the way, is by Jim Burns, first commissioned for the PS Publishing edition of my collection A Very British History, and based on a scene from one of the stories collected there, 'Sea Change, With Monsters'. The ebook of that collection will probably appear in October, after I've finished, and recovered from, the edit of Austral.